The mycelium of Lentinula edodes produces enzymes which may degrade xenobiotics including steroid hormones. The aim of the study was to determine whether the mycelium from in vitro cultures of L. edodes are able to degrade endocrine disruptors such as testosterone and 17α-ethynylestradiol. To prove the possibility of xenobiotics degradation, cultures of L. edodes were cultivated in an Oddoux liquid medium with the addition of synthetic 17α-ethynylestradiol and synthetic testosterone. The endocrine disruptors were extracted from the mycelium and determined qualitatively by RP-HPLC. 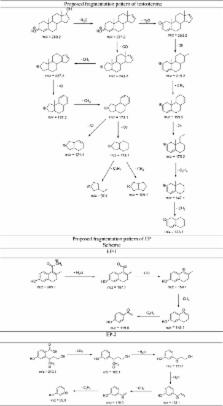 The degradation products of testosterone and 17α-ethynylestradiol were identified using a UPLC/MS/MS analysis. Undegraded testosterone was determined at the amount of 2.97 mg/g dry weight but only in one of the L. edodes extracts from in vitro cultures supplemented with 50 mg of this compound. In turn, 17α-ethynylestradiol was not determined in any samples. Additionally in all extracts, mushroom sterols (ergosterol peroxide and ergosterol) were determined. Their total amounts were significantly lower in samples containing the abovementioned steroids than in extracts from mycelium L. edodes without the addition of steroid hormones. The results demonstrated that the mycelium of L. edodes can be used in the biodegradation process of a water environment contaminated with endocrine disruptors.Electronic supplementary materialThe online version of this article (10.1007/s13205-018-1458-x) contains supplementary material, which is available to authorized users. Structure and action mechanism of ligninolytic enzymes. Lignin is the most abundant renewable source of aromatic polymer in nature, and its decomposition is indispensable for carbon recycling. It is chemically recalcitrant to breakdown by most organisms because of the complex, heterogeneous structure. The white-rot fungi produce an array of extracellular oxidative enzymes that synergistically and efficiently degrade lignin. The major groups of ligninolytic enzymes include lignin peroxidases, manganese peroxidases, versatile peroxidases, and laccases. The peroxidases are heme-containing enzymes with catalytic cycles that involve the activation by H2O2 and substrate reduction of compound I and compound II intermediates. Lignin peroxidases have the unique ability to catalyze oxidative cleavage of C-C bonds and ether (C-O-C) bonds in non-phenolic aromatic substrates of high redox potential. Manganese peroxidases oxidize Mn(II) to Mn(III), which facilitates the degradation of phenolic compounds or, in turn, oxidizes a second mediator for the breakdown of non-phenolic compounds. Versatile peroxidases are hybrids of lignin peroxidase and manganese peroxidase with a bifunctional characteristic. Laccases are multi-copper-containing proteins that catalyze the oxidation of phenolic substrates with concomitant reduction of molecular oxygen to water. This review covers the chemical nature of lignin substrates and focuses on the biochemical properties, molecular structures, reaction mechanisms, and related structures/functions of these enzymes. 17α-Ethynylestradiol alters the peritoneal immune response of gilthead seabream.